The studio is open weekly from Wednesday to Saturday. However we are open Sunday to Tuesday by appointment for groups of 10+. At Florence & Milly, we offer after school art & craft classes to children aged 5 to 11 years. We encourage parents to participate in the classes or alternatively, our craft technicians will guide the children to explore a multitude of art and craft covering a wide range of specialties and skills. We have a small play area if it all gets too much for the little ones and a relaxing area for parents to enjoy a refreshment while keeping a watchful eye. Children are welcome to drop in when they can or come every week and art supplies are provided. One of the most popular activities within the academic year is trips outside of school. For secondary school children they don’t get out of school much during the Junior Certificate and Leaving Certificate, so trips are a chance to destress and have fun. For primary and preschool it is an opportunity for teachers and children to get creative outside the classroom in a fun and child friendly environment. Here at Florence & Milly we offer a great selection of pre-fired pottery to choose from as little as €5 plus studio fee, lots of colour choices in our non-toxic glazes and finishes and all the brushes, sponges, stencils and supplies. We give every student a thorough demonstration before they start decorating and guidance throughout if needed. As a busy Mum, I know firsthand the struggle to entertain our little ones. It takes time to set up and the activity may only last a short while, not to mention there’s always a mess to clean up afterwards. Here at Florence & Milly, we can provide a child-friendly space for you and your precious little ones to explore, develop and discover art and crafts through fun filled time together, with the added bonus that we clean up the mess. We have a small play area if it all gets too much for the little ones and a relaxing area for parents to enjoy a refreshment while keeping a watchful eye. Parents and preschoolers are welcome to drop in when they can or come every week, and art supplies and refreshments are provided. Teen freestyle is an art/craft program for young teens aged 13 to 18, that engages with teens in learning new skills, making art and developing new friendships in a supportive and safe environment. Florence & Milly hopes to provide exhibition and portfolio building opportunities and encourages positive social engagement. Teens are welcome to drop in when they can or come every week, and art supplies are provided. Parents and grandparents, get a free tea or coffee when you print your baby’s little hand or footprints on our pottery on any Thursday or Friday morning. It’s the ideal way to capture those tiny features forever whether on an item to use or to give as a special gift for parents, grandparents and godparents alike. You can paint baby’s footprints on just about any item of pottery, in all different colours. Items such as a tile to frame on the wall, or a clock or a personalised plate. To make the experience less stressful and for Ideas & inspiration, our studio technicians are on hand to help with painting. We have plenty of space for buggies, baby changing facilities and high chairs available. We have a small play area if it all gets too much for the little ones and a relaxing area for parents to enjoy a refreshment while keeping a watchful eye. Please book in advance to avoid disappointment. Our Toddler art class is such messy fun and the best bit is we do the clean up! join us for a morning of creative fun and craft memories together! Cost: €12 per class with a free Tea/coffee or €45 for 5 weeks no booking required. The classes are catered to suit beginners to the experts so It’s possible to have as much or as little instruction that you need from our studio technicians. If you prefer to work on a solo project and just need studio space, then please just pop in and pay studio fee of €5 per hour. Student de-stress is an opportunity to relax, switch off from the world outside the studio and get creative. Lose yourself in the creative process and discover your inner artist while having fun with friends and meeting new people. Bring your favourite beverage and snacks and enjoy the experience of canvas art, life drawing, art history, decoupage, clay craft and much more. Painting Pottery parties are far from being just for children as the experience is hugely enjoyable for adults too! So whether you are organising a hen party, a corporate get-together or just looking to catch up with friends, why not try our adult group pottery painting? A set of unique set for the bride, mug for the office, a gift or keepsake of the day to take home. Florence & Milly is open by appointment for corporate and groups. Bring a bottle of bubbles, order pizza and some snacks and have fun and relax for a fun and creative evening. Included in the Adult party pack is one item of pottery worth €15 and 1 hot drink. Day: Daytime, weekends and evening appointments available. 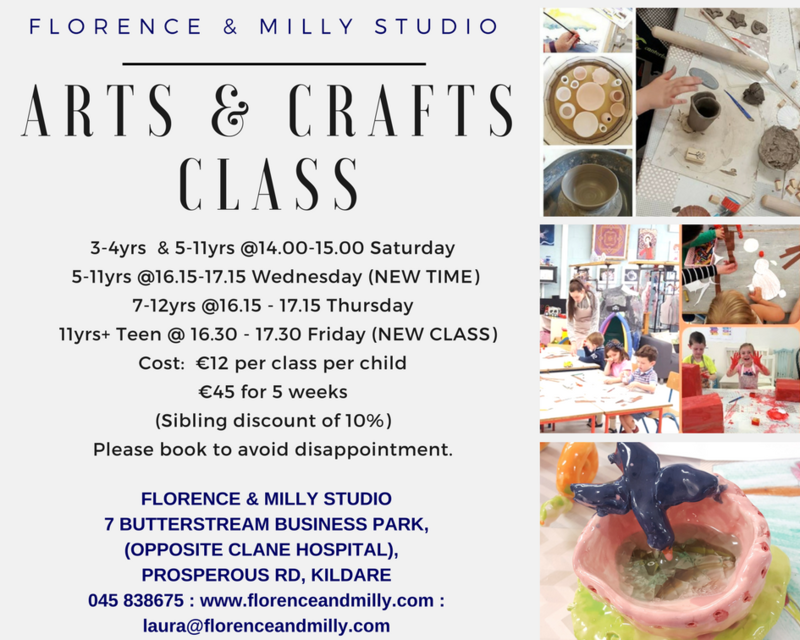 Florence and Milly offers a variety of workshops catering to all age groups and skill levels. Our school holiday camps run from 10am till 3pm. Please check on our store to pre-book closer to holiday times. We cover lots of art and craft techniques and help keep those little minds active and creative during the holidays. Early drop off and late collections available at €8 per day. Please bring along a packed snack, lunch, and drink/water for your child. Are you interested in helping out at Florence & Milly? Check out the positions available and how to apply below. Internship is the best way to get a "foot in the door" of your career choice and the smart way is with a start up company. Florence & Milly opened its doors 3 years ago and are striving to succeed and grow. If you want to grow and learn alongside us we would be delighted to offer you that opportunity. Positions: We have positions available in all areas of the business from Sales, Marketing, PR, Teaching in Summer Camps, Art & Design, Pottery & Ceramics, Upcycling, Furniture restoration and upholstery, Barista & Waiting in our New Cafe opening soon. Interns are unpaid however there may be paid work available from time to time according to business. All interns will be trained according to their positions such as Child Protection, Barista training, Craft specific training. Interns will also have exclusive access to Studio facilities for their own personal creativity such as Free Wifi, Arts & Crafts Mediums, Kiln, Creative space. There is no experience necessary. If you are over 16 yr, still in school or college or a new graduate, or someone who is aggressively pursuing a change in careers, please e-mail laura@florenceandmilly.com for review. If you are interested in applying, please include a cover letter, days/hours of availability and your CV. All openings are PART-TIME and need to be filled A.S.A.P.!! Create and learn about Art and Craft techniques. All mediums and tools are included with the class and projects are based on a theme. Early drop off and late collections available at €5 per hour. Please wear pre loved clothes and bring along a packed snack, lunch and drink/water for your child.